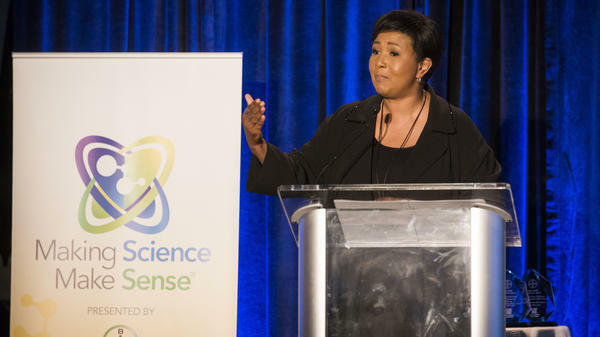 Mae Jemison addresses congressional representatives and distinguished guests at Bayer's Making Science Make Sense 20th anniversary celebration in 2015. Mamoru Mohri and Mae Jemison walk together after arriving with the rest of the STS-47 crew on Sept. 9, 1992, at Kennedy Space Center in Florida. At the Oscars this weekend, one spotlight will shine on African-American women in the space race, thanks to the movie Hidden Figures, which is nominated for three Academy Awards, including best picture. Mae Jemison made history in this field as the first African-American woman in space, as part of the crew on Space Shuttle Endeavour in 1992. Jemison tells NPR's Ari Shapiro she welcomes this new interest in women and minorities who broke boundaries in space because those people were previously excluded from the narrative. "Well, I think it's one of those things that really needs to be done," Jemison says. "And this is because people of all types have made contributions across the spectrum of the sciences, across the spectrum of space exploration, and they have been left out many times, purposefully." I always think of it as like, "What do you do with your place at the table?" If you act just like everyone else, what difference does it make that you're there? And so for me — having grown up on the South Side of Chicago going to public schools, having been a medical doctor, having worked in Cambodian refugee camps as well as being an engineer as well as being someone who was very versed in dance and the arts — yes, I'm supposed to bring those perspectives to bear on the questions that we ask about space exploration. How do we get more people involved? How do we understand how the various technologies can help benefit people across the world? Those were important things for me, so I was aware of that, yet at the same time, you have a job to do. So if you know that those things exist, it makes it easier for you to get involved. For example, it helps to know what an engineer is. It helps to know what a biotechnician is, so you're not afraid of it. Then, it's experience. When you do hands-on science, you learn to — you learn about electricity by wiring a flashlight. And then it's expectation. And that expectation is, we should expect our kids to succeed and to achieve. Children live up or down to our expectations. And so, I always call it the three E's: experience, expectation and exposure. So the efforts to diversify the pool, very often, are couched in things like, "We want them to behave and act like we do." Or there are people who get degrees, and then they're not included because ... it's a bevy of things. There's no one single thing. Let me give you the results of a Bayer Corp. survey as part of its Making Science Make Sense program. They surveyed women and minority members of the American Chemical Society. And what was found is that the place where these people had the most discouragement from studying science was in college by a college professor. Over 40 percent of them had that happen to them. I want to make sure that that future that we're creating is one that is the best it can be for people around the world, and also one that includes the full range of our talent and our skills — and you know, gender and ethnicity, geography — to solving the world's problems. At the Oscars this weekend, one spotlight will shine on African-American women in the space race. The movie "Hidden Figures" is nominated for three Academy Awards, including best picture. We're going to talk now with someone who made history in this field. Dr. Mae Jemison was the first African-American woman in space. She was on the space shuttle Endeavor in 1992 and joins us now. Welcome to ALL THINGS CONSIDERED. MAE JEMISON: Thank you very much. SHAPIRO: You were hardly a hidden figure, and yet there does seem to be new interest today in women who broke boundaries in space, particularly women of color. What's it like to see all of this attention paid to the field that you entered decades ago? JEMISON: Well, I think it's one of those things that's - really needs to be done. And this is because people of all types have made contributions across the spectrum of the sciences, across the spectrum of exploration, and they have been left out many times purposefully. SHAPIRO: I want to get to how best to take advantage of hidden talents that exist across the population. But first, can you take us back to 1987, when you entered the NASA space program? Was the fact that you were a groundbreaking figure something you were reminded of daily? Or were you able to let that recede into the background and focus on the work? JEMISON: I always think of it as like, what do you do with your place at the table? If you act just like everyone else, what difference does it make that you're there? And so for me - having grown up on the South Side of Chicago, gone to public schools, having been a medical doctor, having worked in Cambodian refugee camps, as well as being an engineer, as well as being someone who was very first in dance and the arts - yes, I'm supposed to bring those perspectives to bear on the questions that we ask about space exploration. How do we get more people involved? How do we understand how the various technologies can help benefit people across the world? Those were important things for me. So I was aware of that, yet at the same time you have a job to do. SHAPIRO: Since you left NASA about 25 years ago, you have taken on a lot of projects. And one consistent focus of yours has been getting more women and minorities into math and science fields. What did you learn from your own experience about what works? JEMISON: I think that there are really important things that we have to do with students to get them to succeed in science, to go on and stay with careers. And that includes the idea of being exposed to something. So if you know that those things exist, it makes it easier for you to get involved. For example, it helps to know what an engineer is. It helps to know what a biotechnician is so you're not afraid of it. Then it's experience. When you do hands-on science, you learn to - you learn about electricity by wiring a flashlight. And then it's expectation. And that expectation is we should expect our kids to succeed and to achieve. Children live up or down to our expectations. And so I always call it the three Es - right? - experience, expectation and exposure. SHAPIRO: The National Science Foundation says 84 percent of working professionals in science and engineering jobs today are white or Asian men. Why do you think the efforts to diversify this pool have not been more successful? JEMISON: So the efforts to diversify the pool very often are couched in things like we want them to behave and act like we do. Or there are people who get degrees and then they're not included because there's a - it's a bevy of things. There's no one single thing. Let me give you the results of a Bayer Corporation survey as part of its Making Science Make Sense program. They surveyed women and minority members of the American Chemical Society. And what was found is that the place where these people had the most discouragement from studying science was in college by a college professor. Over 40 percent of them had that happen to them. I want to make sure that that future that we're creating is one that's as best can be for people around the world, and also one that includes the full range of our talent and our skills and, you know, gender and ethnicity, geography to solving the world's problems. 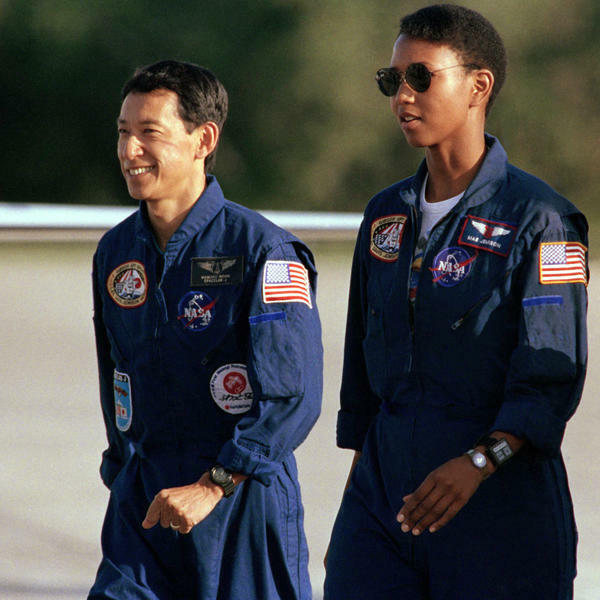 SHAPIRO: Dr. Mae Jemison, thank you so much for your time.